Join the discussion on our forums! Come discuss Supercollider over in our dedicated Supercollider discussion topic. Boom's Second Law of Motion: HIT IT VERY HARD! I just love this damn card!!! How is this gonna work with overkill minions ? do the minion overkill activate if it "over"kill a neighbor ? Nah, overkill only activates on the controlling player's turn. So if you were to run your minion into an enemy's overkill minion, the effect won't proc. Phew! I think this is one of the best weapons in the game. The removal efficiency is absurd! I think this weapon has been a little underrated... It can really prevent opponents from playing large minions and controlling the board at the same time, because they'll end up clearing their own board that way... I imagine it's a lot more effective in arena than constructed, especially considering the lack of spells and focus on neutral minions in arena that seems to be the case with post-Boomsday arena. Of course, very weak to weapon removal, but I'd say it's overall a decent card vs. any deck that relies on somewhat large minions. It's a notable counter to divine shield taunts as well, as the 1 dmg tap from the hammer breaks the divine shield before the minion's attack. Definitely very underrated. It's really good in Odd Warrior lists, and it's very effective against most meta decks these days. Ended up replacing Gorehowl with it in my list, and the results have been way better. Most underrated card from the set. It has definitely been good for warrior, odd warrior in specific, fans like myself. Cool looking card and all, hope it's not as easy to play around as it looks though. Probably trash tier but I hope I'm wrong. each charge is worse than betrayal. Weak to weapon removal, and very expensive. I think this card is garbage. It should've read just adjacent minions (implying both) then it would be interesting and playable. 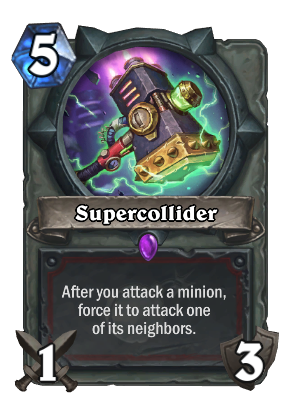 If your opponent has only two minions, then Supercollider can clear them both, while Betrayal clears only one. Fantastic 1-of in Standard. Seriously, this can be more efficient than Brawl, and be used 3 times. I need to see this in practice. It sounds good but the wording is so... weird. How could this card be bad, this has a potential to kill two big minions in one swing and you can do it 2 more times. Only cost 5 mana and you only play it when big minions comes out. also you can attack the one next to the minion and combo with execution. This card is (or looks) bad because Brawl is a card.